Architecture is an exciting and adventurous field; where creativity and practicality go hand-in-hand. Read on to know how you can build a career in architecture after B.Arch. Architecture has a lot of scope in India. Students who are pursuing B.Arch, or are preparing for architecture entrance exams, can look at the various career prospects to pursue after the course. In order to pursue B.Arch, one has to first clear entrance exams such as NATA (National Aptitude Test in Architecture). NATA is conducted by the Council of Architecture. Besides, there are JEE Main Paper 2 conducted by NTA, JEE Advanced AAT (Architecture Aptitude Test) conducted by the Indian Institutes of Technology (IITs). Before entering in this field, keep in mind that a good architect is one who is imaginative, creative, is able to critically assess things, have attention to details, and have good communication skills. After getting your B.Arch degree, you can either opt for higher studies or apply for jobs. Both lead to the development of specialised skill sets that help further enhance career prospects. There are several positions in organizations for an architect such as architectural engineer, historian, building researcher, draftsman, interior designer, section engineer, technologist, art director, contractor, inspector, planner. 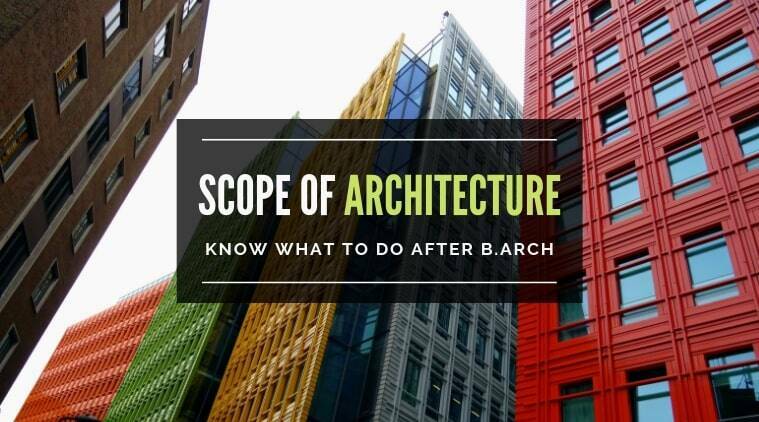 Let us look at the first option of pursuing M.Arch after B.Arch. There are at least hundreds of options to choose from. The most popular ones are School of Planning and Architecture (SAP), Delhi, IIT Roorkee, Jadavpur University, Sir JJ College of Architecture, CEPT University. GATE (Graduate Aptitude Test in Engineering) and CEED are important exams for B.Arch students in order to pursue a masters program. Besides Master of Architecture, one can pursue Master of Urban Design, Master of Design (Industrial Design), Master of Planning (Environmental Planning / Housing / Regional Planning / Transport Planning / Urban Planning), Master of Landscape Architecture, Master of Building Engineering and Management. The other option after B.Arch is to get a job. Herein, you should choose your calling based on your interest and abilities. Think of whether you want to go for urban planning, urban development corporations, public works department, interior designing, or any other particular aspect of being an architect excites you the most and you are good at that too. Architect firms, consultancies, government organizations have several positions open at all times for such positions. Some public and government organizations that offer jobs for architects are Archaeological Department, Central and State Public Work Departments, City Development Authorities, Department Of Railways, Housing and Urban Development Corporation, Housing Development Corporations, Ministry of Defense, Municipalities, National Building Organization, National Institutes of Urban Affairs and Housing, Public Works Department, State Housing Boards. The competitive world of infrastructure encompasses works including spatial design, aesthetics, safety management, material management, and several others. Here is wishing you best of luck for your career as an architect!